It seems that the first woman to graduate was a Venetian. Elena Lucrezia Cornaro Loredan Piscopia was born in 1646 from a Venetian Family of ancient nobility, which already gave Doges and Cardinals to the Republic. Since her childhood she demonstrated dotes of wide intelligence and sensibility: her father was an esteemed Procurator of St. Mark, and could allow her to have aside the best teachers available. After Greek and Latin, Helen studies Natural Sciences, Geography, Astronomy, Mathematichs and various other languages like Israelitic, Spanish, French and Arabian, worthing the nickname of Oraculum Septilingue. Elena Lucrezia Cornaro Loredan Piscopia reaches a deep mathematical knowledge under the teaching of Master Rinaldini. This extraordinary woman studies just to satisfy her own thirst for knowledge, but willing to please her father's ambition, she accept to be presented at the College of the University of Padua to be Graduated in Theology. This aim meets the opposition of some High Priests that do not allow a woman to obtain the Theological Title, but she is admitted to the Philosopy Graduating. 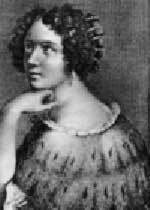 In 1678, after the examination in Padua, at the presence of hundreds of spectators, Elena Lucrezia Cornaro Loredan Piscopia was graduated in Philosopy, first woman in the world to graduate. In the last years of her, short indeed, life, Helen dedicated herself in Charities, joining the Oblate Benedettine (an Order of Catholic nuns), but not takeing the votes. 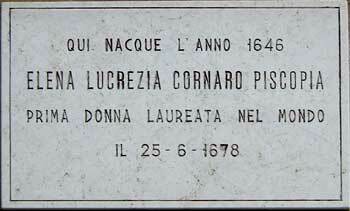 Elena Lucrezia Cornaro Loredan Piscopia died in Padua 38 years old during 1684, and was buried in the church of Santa Giustina. A sculpture in the Padua University, a stained glass window in the University of Vassar USA, and the memorial you can see aside, located on her native home in Venice (now seat of the Municipality) are to remember Elena Lucrezia Cornaro Loredan Piscopia.